Hello guys. Just discovered this awesome tool! I am testing it out and would be really interested in the email function it has. I don't know if I'm doing something wrong, but I would like som info. I couldn't try how to use the gmail relay thing. If that's the way, a little help would be more than appreciated. I'm sure that I'm doing something wrong here, but could you help me a bit? This means that GMail doesn't accept mail submissions from your network address when you don't tell Google who you are. This is likely because you are on a residential network, so it's a reasonable restriction. The gist of it is that Google doesn't like people entering their Google passwords into anything that is NOT Google-owned. The article at the link lists two workarounds for this, have a look. Another option is to set up a new and separate Gmail account just for sending alerts to your primary email. This way you can set it up as per https://support.google.com/accounts/answer/6010255 and don't touch this setting on your main account. 1. 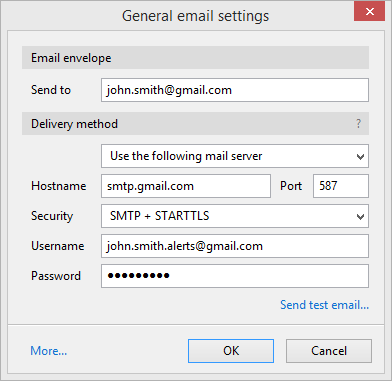 Create a new Gmail account - for example, "john.smith.alerts@gmail.com"
It worked just fine. It was a easier than I thought in the end. Thanks for this! One last question and a bit out of topic: buying a normal licence is valid until when?